Bournemouth Borough Council: Pure Town Planning have recently secured planning permission for a large side extension to a grand (nine bedroom) family dwelling in the Meyrick Park and Talbot Woods Conservation Area in Bournemouth. The owner approached us having just received a refusal for a similar two storey side extension. Pure Town Planning were initially asked for advice on the prospects for an appeal. However we felt that a better solution could be achieved through negotiation with Bournemouth Borough Council‘s planning and conservation officers under a revised application – saving the owner time and money. The previous application was refused as the Council considered that the “scale, bulk, and design of the extension would not be in keeping with the style and appearance of the existing dwelling, and would be detrimental to the character of the Meyrick Park/Talbot Woods Conservation Area”. Pure Town Planning advised the applicant how to alter the proposal in order to both achieve his goals in terms of floorspace, but more importantly achieve planning permission. We prepared and submitted a revised proposal to Bournemouth Borough Council together with a full Planning and Conservation Statement justifying why the proposal would not detrimentally impact on the existing dwelling or the surrounding conservation area. As a result of regular discussions with the planning officers, we were able to convince them that this revised proposal overcame all concerns that they had with the previous scheme and push the application through to an approval within the statutory 8-week time frame. 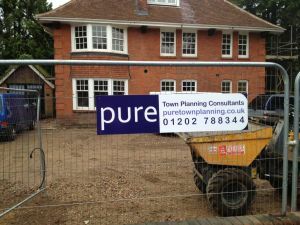 If you are planning a large extension (or even a smaller one) and would like some advice on how best to achieve planning permission for what you want, then why not give us a call today on 01202 585524 or email info@puretownplanning.co.uk.